On Episode 217 of CrossFit Radio, host Justin Judkins interviewed cooking expert Nick Massie, as well as Jason Ackerman, who owns CrossFit Albany and Clifton Park CrossFit. This episode was webcast live at 6 p.m. PDT on Wednesday, March 28, 2012. The WOW (Workout of the Week) is from CrossFit Complete in Midwest City, Okla.
3:00 Nick Massie is a professional chef who’s making it his mission to educate CrossFitters on the finer points of cooking so they can dial in their nutrition without giving up delicious food. Massie explained his most recent project: creating a website so CrossFitters can learn to cook and feel more comfortable in the kitchen. He described different features the website will possess and outlined some challenges he wants to conduct online. Massie explained how the recent influence of Gary Taubes shaped his philosophies. 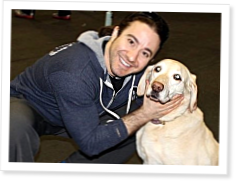 29:40 Jason Ackerman owns CrossFit Clifton Park and Albany CrossFit. He’s looking to hire a new coach, so he devised an innovative process to choose the perfect candidate. Borrowing an idea from reality programming, he created a TV-style competition that will include challenges and immunities, along with input from the community. In case you don’t have the ability to recreate Survivor, Ackerman gave advice on choosing a good coach and how to become a better coach. Finally, he talked about a Garage Games Competition in the near future. Anyone find Nick's website? I couldn't find anything. What happened to episode 216? Can someone post Nicks Website, I am still having trouble finding! It is suppose to launch 01 JUN 2012. Loved this episode! New to the podcasts but finding them very beneficial. Please keep them coming and thank you. Justin, I'd like to send you an email. If you wouldn't mind, what is your e-mail please sir? Thank you! Hi Justin how do I contact you? Can't find an email here on the site. When ou get amoeba would like to send you an email. Thank you!